Last July 11, I got a chance to visit the Lapu-Lapu Children's Fair. It is intended to introduce grade school children to the life of Lapu-Lapu, the first Filipino hero known to resist Spanish colonization in Philippine shores, in an interactive learning experience. 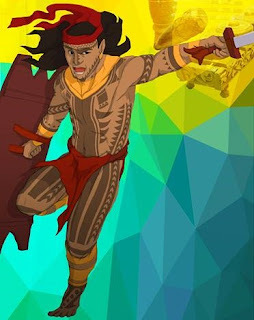 It aims to let kids not only know the man behind his heroic deed, but also learn about their true Filipino roots through a visualization of the country in the pre-colonial setting. School may have taught us this part of our race's history, but it's not given much importance. As a result, it doesn't make any impact to the Filipino people today. This fair served as an avenue for education on where they should start tracing their history. And since kids are the main target, it's expected that they have fun and enjoy it. I gave this one a go to see how this is going to work out. As one enters the fair, he is welcomed by the loud, grooving beats of the native drums in the prosperous banwa (village) of Lapu-Lapu. He is greeted by the village people, and is introduced to their simple, happy and humble life. Along his tour in the banwa, he gets to play sungka. It is a game where 2 players use a wooden pea-pod shaped board with 7 small holes in rows on each side, and a big hole on each end filled with an equal number of sigays (small shells). The aim is to capture as many shells as he can and place them into his ulo (head) or the big hole. He also gets to make a banig (handwoven mat), execute the fundamentals of the martial art arnis, and read & write their language and writing system called baybayin. He also gets to paint his own native pots, see different wire sculptures, and mark a part of his body with a warriors' tattoo. Through the props, visuals and costumes present, I was able to feel a glorious mood and an atmosphere of Filipino greatness. I was also able to feel a message they want to bring to the audience. It's a message that says they should treasure and cherish this period in time, for it reminds them of their luster as a race. Their ability to bring these important factors is what I'm satisfied at, so a good job right there. I would love to see from here more interactive experiences like pottery-making, weapon-making and jewelry-making, because I feel that it will make the atmosphere and mood stronger for the audience to see and appreciate. But with what's presented, it's a good one. 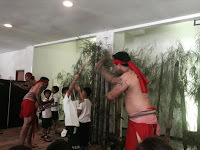 After a tour around the village, he visits Lapu-Lapu's balay (house), where he is greeted by the manunugtog (musicians) with their tribal musical instruments. Upon entering, he would be in awe as it's surrounded with splendid wealth. He meets the hero himself, who is the datu (chieftain) of the banwa. 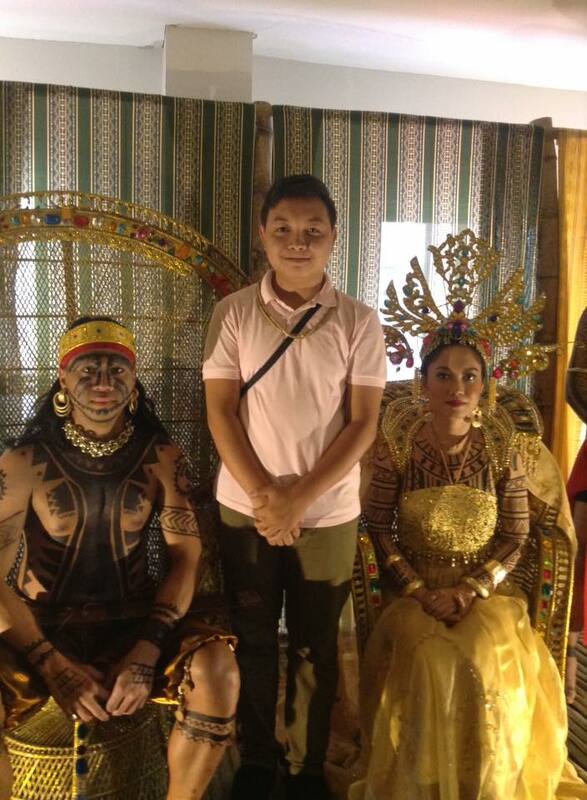 He also meets his wife Reyna Bulakna, his bagani (warriors), and his ulipon (slaves). He then gets to learn of life in the royal house. After which, he gets a chance to play with the musical instruments like the kubing (jaw harp) kulintang (row of small, horizontally laid gongs), dabakan (single-headed drum used as a kulintang support instrument) and the agung (a set of two wide-rimmed, vertically suspended gongs also used as a kulintang support instrument). I feel a strong effect on this one. Every element for this depiction is done perfectly. 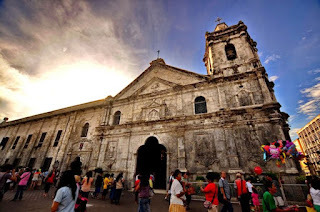 I can see a message from here saying that the Filipinos not only have a treasured glory, but also have a built-in dignity. Because of this, we earned the respect of the world. I'm glad that they have made this direction to impart this to the audience, and I agree that it's the right one to take. 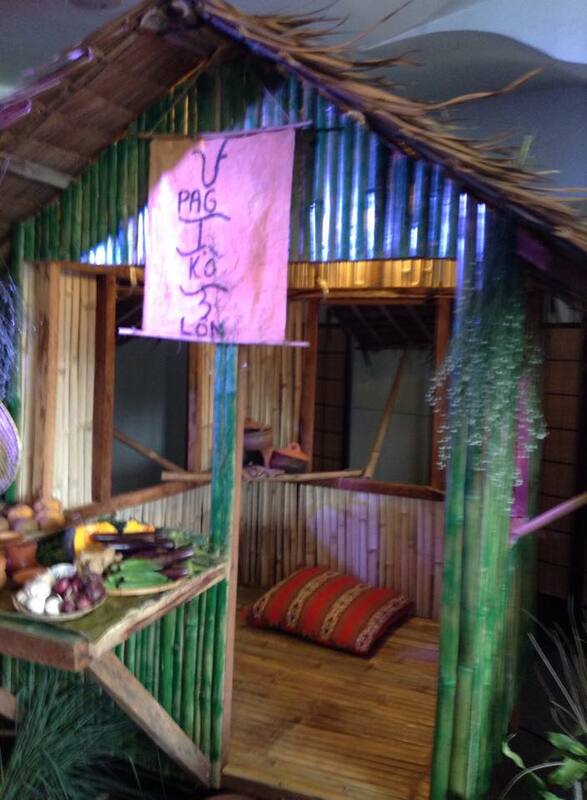 If there's one thing I would like to see more from here, it would be dramatization of Lapu-Lapu's roles as a datu. I would like to see how he promulgates a law, exercises his judgment on an accused criminal or prepares leading to battle with his warriors. This would give a stronger effect when the audience can understand better on his duty as a ruler and appreciate him in the end. But with what's presented, it's again a good one. After the house visit, he goes to a movie house to see a childhood adventure of our hero and learn valuable lessons from it. I loved the story first of all. 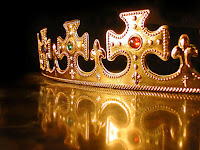 It gives a pinch of heart to inspire the audience the values of obedience, bravery and courage. I loved the animation style, as it's distinct and is something we can call our own. The audio and video editing was done well in such a way that the mood of the story can be felt, which is good. And I can see here a visual appeal. Overall, it has all the elements to make up a good animated production. I hope I can see in the future a few magic touches like talking characters and cinematic effects, as it has potential to become a great animated short film. But with what's presented, I'm good with it. The last stop is a visit to the museum. He would get to see several wonderfully made illustrations of our beloved hero. Then, he prepares himself in full learning mode for the whole tour. It's in here that he gets to learn the culture of the pre-colonial Filipino. He gets to know deeply all he learned from the banwa and the balay, and gain new ones like the religious beliefs, clothes, weapons, and jewelries. 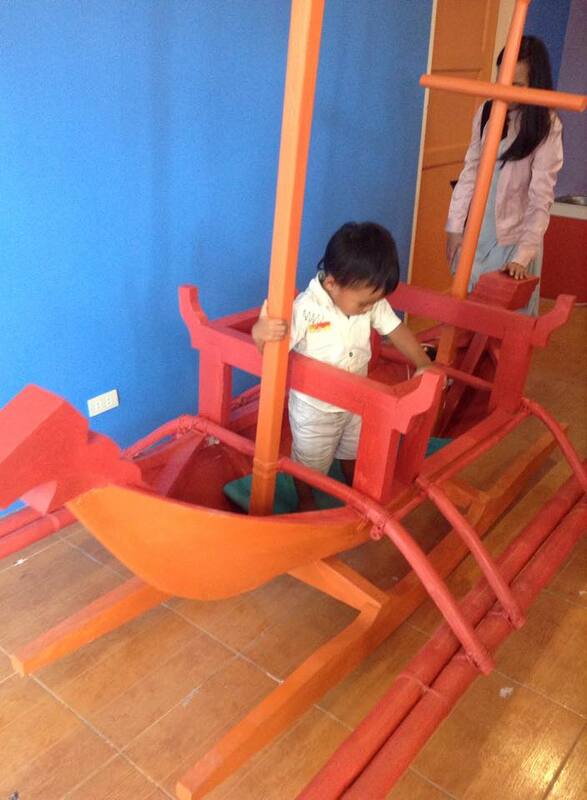 He also gets a chance to ride an ancient karakowa, the battleship used during Lapu-Lapu's time. I loved the mood of the museum as it's calm and relaxing. It gives an atmosphere of a good place to unwind from the joyful and lively noises of Lapu-Lapu' humble abode. The presentation displays were okay. They have their own visual appeal to make themselves an interest for learning. What I like most about here is the introduction of modern-day heroes. 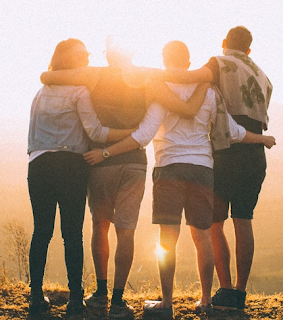 It's a good move to inspire them that they, too, can be heroes with all that they are. This is surely a take home from here (and I would say, the whole fair). As for the interactive activities, they are okay. I would love to see more of them. 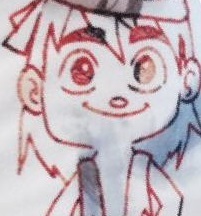 He could dress up like an ordinary Filipino native, sing a native song or learn a native dance. It would lead to a worthwhile museum experience. But with what's presented, this is a good one. The whole team said that more improvements are needed for the fair. But looking at it in overall, it's not bad for a first actually. They have given their all for this one to be the best possible, and I can see that. In fact, I had fun going through the whole experience in discovering my roots. So far, it has received positive feedback, which is good. And since they plan to conduct this at least once a year, I hope I can get a chance to visit annually to see the improvements they plan making. I'm looking at the country now, and it's evident that our culture is influenced by our colonizers. But I believe that in time the people will get to realize this and know the Filipino's true identity. And when all are impacted with this, I hope that it would also impact the whole world. The Chinese, Japanese, Koreans and Indians have done it. I believe that the Filipinos can do it. It's a long road, but there will be light at the end of it. It is my hope that through this affair, there would be at least one Filipino child who can be a nation-builder looking up to Lapu-Lapu as one of his inspirations. This will be seeds for him. But when they grow, it could bring him to a life-changing perspective. So to the people behind the success of the fair, thank you for everything to make this happen. My kudos to all of you, and a job well done. Thanks a lot Earl for sharing the Lapu Lapu Fair. Yes, let us hope and pray that the kids pf today will continue to carry the burden of nation building. Thank you te for the warm reception of this feedback. We will be in prayer for this.